based in Hamburg with bureau in London. informational and advocacy videos on health and human rights. Managing Director, filmmaker, Nicholas Feustel. Two of our health promotion video series were awarded! 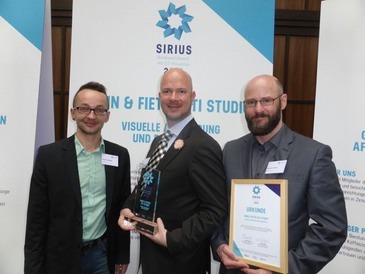 In June 2015, georgetown media’s video series on HIV & STIs for deaf gay men in German Sign Language won the German AIDS Foundation’s prestigious Media Award. Earlier, in May, Hein & Fietes STI STUDIO, another infotainment video series on HIV & STIs, targeted at gay men, which is currently in post-production, won the SIRIUS Award for HIV/STI Prevention, a grant provided by the German Ministry of Health, the Federal Centre for Health Education, and the Private Health Insurers’ Association.